Take on the KAPOW! Superhero Challenge and put the fun in fundraising for your local hospice! 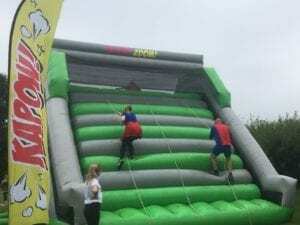 This 5k fun-filled obstacle course is made up of a range of unique giant inflatables to climb, duck, dodge and slide around. There are slides, tunnels and so much more including a foam filled fun finish! This is the first time KAPOW! Superhero Challenge has taken place in in Cumbria. KAPOW! is perfect for groups of friends and families and could be a great team building day out; so assemble your very own superhero squad of Wonder Women and Supermen and Incredibles. There are bound to be some going undetected at work, the gym or in your family, so seek them out and become our Hospice Heroes by supporting Hospice at Home West Cumbria. You don’t need super powers to take part, however you must be at least 1.2 tall, and all under 16s must be accompanied by a particpating adult.